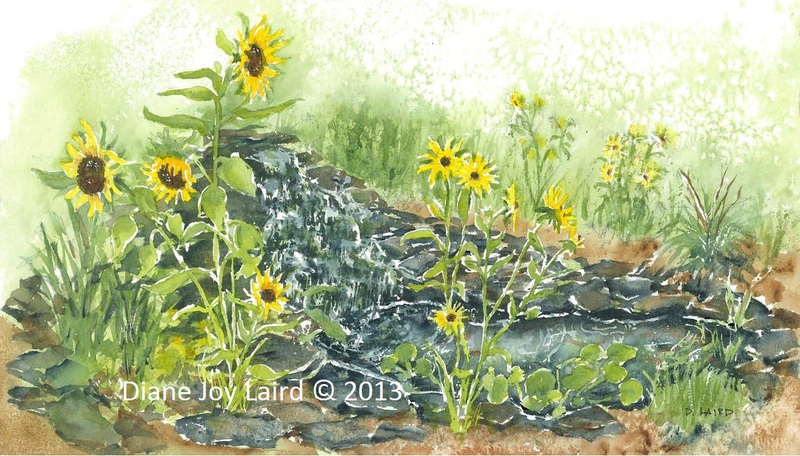 This painting, entitled Sunflowers, was completed for Jim and Joann Rich, owners of The Huntingfield Creek Inn -a lovely bed and breakfast just outside of the Eastern Neck Wildlife Refuge. The Refuge is part of the Northeast Region U.S. Fish & Wildlife Service. 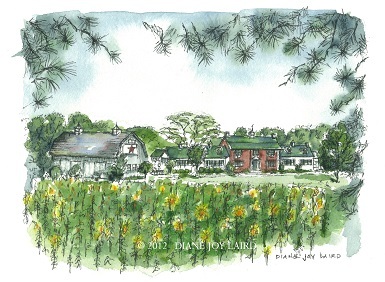 The original painting is 8" x 10" and Highlights the breathtaking sunflowers that adorn the Inn's side lawn every summer. The grounds of the Inn feature 6' zinnias, a large lavender garden, and access to the lovely Chesapeake Bay. Limited edition prints and notecards are now available. Sunflowers are an ever-popular subject matter. The 11" x 15" original painting is currently available. Please contact the artist for purchasing information. Limited edition prints and notecards are also available. Sunny Morning on The Green was painted in a 3-hour timed competition in the 2013 Kent County Tourism Plein Air Paint Out. The original painting is currently available. Please contact the artist for more information. Limited edition prints and note cards are now available. 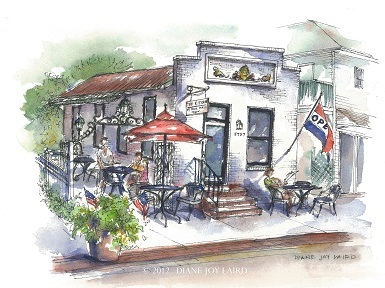 The Bayard House Restaurant and The Hole in the Wall Bar and Lounge was painted during the September 2013 Chesapeake City Plein Air Paint Out. 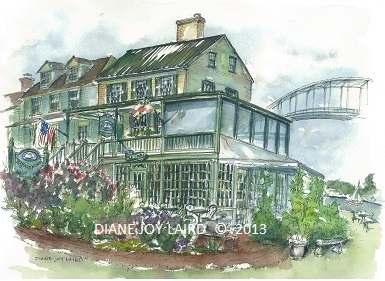 The 12" x 16" original painting of this landmark restaurant, located along the picturesque waterfront on the banks of the Chesapeake and Delaware Canal, is currently available for purchase. Please contact the artist for more information. Limited edition prints and note cards are also available. 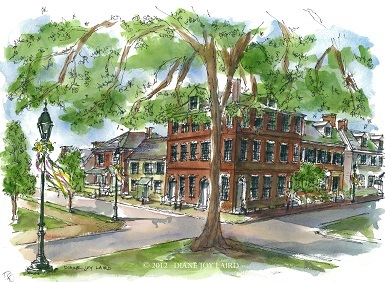 This painting of the Book Plate was made during a misty, cold plein air event in Chestertown in April 2015. 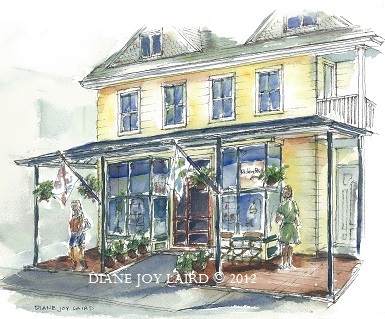 Despite the weather, the result was a colorful, delightful rendition of the landmark store at 112 South Cross Street. 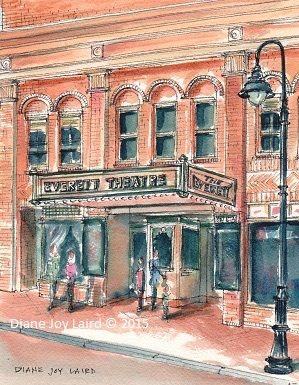 This painting of The Everett Theatre was awarded First Place in Paint the Town! in Middletown (2015), an event sponsored by The Gibby Arts Center. See also image of neighboring businesses in Middletown: Purple Sage and Immediato's Bistro. Also available in prints and notecards. Originally built in 1850, The Farmhouse is a spacious facility featuring cathedral ceilings, glimmering skylights, hardwood floors, pewter chandeliers, and large bay windows. 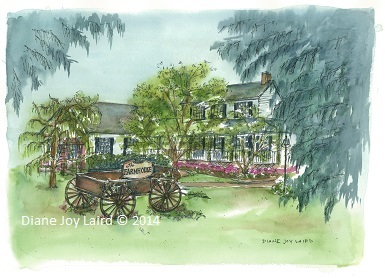 The Farmhouse painted was completed for a friend who was married there. Limited edition prints and note cards are also available. This painting of The Hickory Stick depicts a fine summer afternoon shopping excursion in this waterman's town. 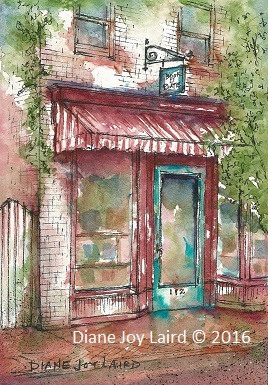 It was completed in July 2012 in preparation for the August First Friday exhibit at Hogan's Gallery in Chestertown, MD. The original painting is 8" x 10" and is in the art collection of Sandy Scott, owner of The Hickory Stick. Limited edition prints and notecards are now available. This painting of The Kitchen depicts a typical summer lunchtime in this waterman's town. 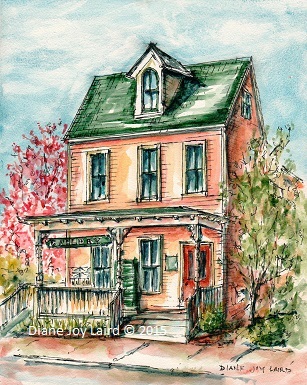 It was completed in July 2012 in preparation for the August First Friday exhibit at Hogan's Gallery in Chestertown, MD. 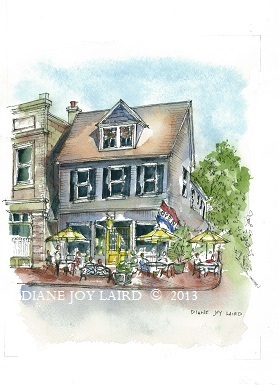 The original painting is 8" x 10" and is owned by Monica and Steve Quigg, owners of The Kitchen. Limited edition prints and notecards are now available. 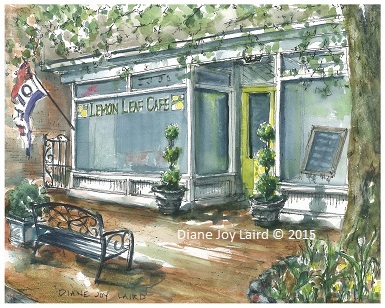 This 8" x 10" painting of the Lemon Leaf Cafe depicts the previous location of the restaurant on Cannon Street. The restaurant is now located on High Street. The painting was painted during the Chester River Arts 2013 Plein Air Paint Out and is in the art collection of Kathy Heffron of Still Pond, MD. Limited edition prints and note cards are now available.